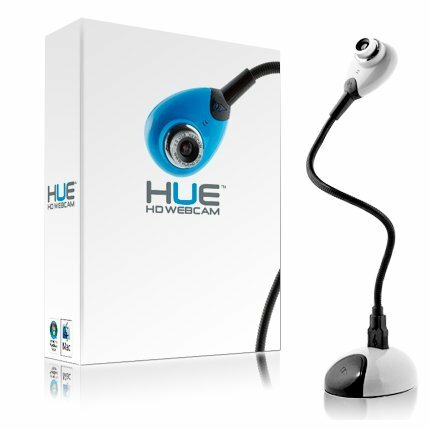 The HUE webcam for Windows and Mac has a brilliant high def resolution picture capture, great sound through its internal USB microphone and easy installation. It's compatible with Skype, MSN Messenger, Yahoo Messenger and iChat (requires Mac OS X 10.4.9 or higher). Its innovative & versatile design allows limitless positioning options - users can leave webcam in its base or remove it and plug it directly into a laptop USB for optimal mobility. Produce live videos and email them to associates, family and friends, or chat in real-time around the globe over Skype, MSN, Yahoo or iChat completely FREE - the HD webcam can do it all with superb video quality and superior sound. Unique, innovatively designed USB camera with a built-in microphone. Widely used as a portable classroom document camera / visualiser in conjunction with a whiteboard. Perfect for creating animated films, live videos or time-lapse recordings to post on YouTube, and for video calling with Skype, FaceTime etc. Compatible with Microsoft Windows (8, 7, Vista, XP), Apple Mac OS X (10.4.3 or above) and Linux. Plug and play: simply connect the HUE camera to your computer's USB port and it will be ready to use. If you have any questions about this product by HueHD, contact us by completing and submitting the form below. If you are looking for a specif part number, please include it with your message.